by: Augustus Choate Hamlin, M.D. Order The History of Mount Mica at the same time and save $15.00. The Hamlin Set = $80.00. 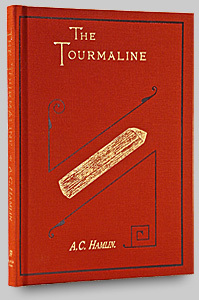 The Tourmaline was first published in 1873, by Augustus Choate Hamlin, with a limited production run of 200 plus copies. The majority of these were printed with a brownish-red cover, while a few were done in a dark blue and green. The original volumes are exceedingly rare, highly coveted, and most that have survived are in private and institutional collections. This volume is a reproduction, reprint of the original book, recreated as close to the original as feasibly possible today. Unlike the originals, acid free paper was used through-out, so the collector will be assured of it's longevity and stability. Great care was even taken to have a tooling die created to emboss the cover similar to the original. The Tourmaline can be considered a companion book to "The History of Mount Mica," also authored by Dr. Hamlin and on our book list. Historically, this text is of major importance, as it is considered the first treatise on tourmaline in the United States. Dr. Hamlin details the known history of tourmaline, it's known properties and locations up to 1873. Additionally, the reader is introduced for the first time to the notorious story of the discovery of the Mount Mica Mine, Paris, Maine, the world famous tourmaline location. Hamlin's charming writing style captures your attention and you will never forget how the first tourmaline was found at Mount Mica. Dr. Hamlin has also included in his book four color images of tourmaline crystals he found at Mount Mica. These were found while mining at this location prior to 1873. These are the first color images ever published of tourmaline in the United States, and the second time color images of tourmaline were ever printed historically. Dr. Hamlin is also the painter of these original images and we include one example here. This volume is a must for the serious student or collector in mineralogy. Whether you enjoy the historical, the scientific or gemological aspects of the field, you will love having this volume on your library shelf. Rubellite Press has taken great pleasure in bringing this treasured treatise back to life!